Sarfraz Ahmed is a right-handed wicket-keeper batsman for Pakistan who has played five ODIs for the Under-19 team. He has served as the captain for the U-19 World Cup in 2006 after surprising the spectators by scoring back-to-back half centuries in only his third and fourth match. With Pakistan winning the World Cup, Sarfraz was duly outlined from the domestic cricket. He played first class cricket for Karachi. He played only ten first-class matches in his first full season for Karachi and Sind - as well as nine 'A' matches and five Twenty20 games. He scored an aggregate of 523 runs with the help of five half-centuries, with 28 dismissals behind the stumps. This remarkable performance did not go unnoticed as Sarfraz was named in the tour against Australia 'A' during the second half of 2007 as well as facing the South Africans in a tour match. Sarfraz Ahmed had a terrific start to the 2007-08 season, where he has struck three fifties in the first five matches with 21 dismissals behind the stumps. He played the Test match in Hobart against Australia in 2010, and has also played ODIs sporadically for Pakistan. On 4th December 2014, Sarfraz Ahmed’s lucky star shinned bright as he scored a brilliant 76 not out in a T20 match against New Zealand. With that win, Pakistan became the first team to reach 50 T20 wins on the record. Considering his all-round performance with the bat and behind the stumps, he was selected for the World Cup 2015 squad. He did not have a chance to prove his skills in the first four matches of the World Cup. Sarfraz Ahmed became a star of Pakistan Cricket after the latest match of World Cup 2015 between Pakistan and South Africa. He made a debut in the current World Cup with blistering 49 runs on 49 balls, and was unfortunate to make his fifty. He gave some worth watching performance behind the stumps with 6 catches. He was able to equal the world record of most dismissals in ODIs. He was rewarded Man of the Match award for his all-round performance. 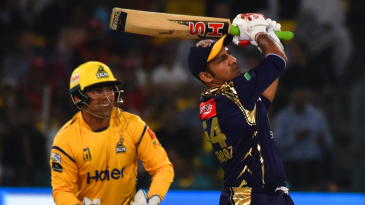 Find Sarfraz Ahmed profile and stats of batting, bowling and fielding including latest updated news of Sarfraz Ahmed, videos and images at Hamariweb.com. Also find detail Player profile and career statistics of Sarfraz Ahmed of Pakistan. I think Sarfraz is the only guy who deserve the captaincy of all the three formats of cricket, even on this stage when just the few series are remaining for the preparation of World Cup it is difficult to change the captain. i hope you see my message and personal attension. We have finally found a decent wicket keeper batsman in the shape of Sarfraz Ahmed. He is much better than Akmal brothers and has the potential to bat as well when needed. 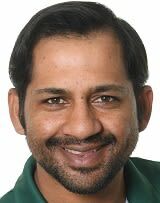 Sarfraz Ahmed is the vice captain of Pakistan T20 team. The performance of Quetta Gladiators was quiet amazing inhis captaincy that is why many peoples expect that he is a captain in future. i don't think so he should a vice captian, he should be a captian of Pakistan team. Sarfraz Ahmed know to do to captian ship as he already done in world cup under 19 and he is the one lucky captian who beaten Indian under 19 team. well i dont want saefaraz to be a captian in this stage of his career he is very good no dout about it.but he needs more time to prove him self. 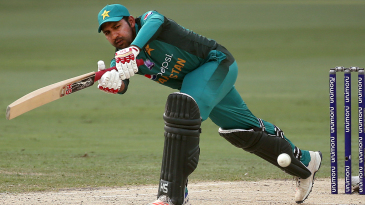 Sarfraz Ahmed - Find Sarfraz Ahmed of Pakistan Cricket Team complete player profile, number of matches, runs score, wickets & catches, Statistics, Records, Sarfraz Ahmed Latest News, Sarfraz Ahmed Videos, Sarfraz Ahmed Photos, and other Sarfraz Ahmed Cricket Team players.